Wat Chalong (or Chalong Temple) Fair is definitely the largest of all temple fairs on the island. It's a seven-day extravaganza of color, aromas, sounds and people buzzing everywhere. There's all kinds of performances, fun and games going on. Every night at around 7pm, delighted audiences can enjoy some dazzling performances by famous Thai folk (luk-thung) singers and traditional southern Thai puppeteers. It first began in 1933 with local farmers living around Wat Chalong. After lots of hard work and a successful harvest they would get together and create a kind of fun fair on the temple grounds. 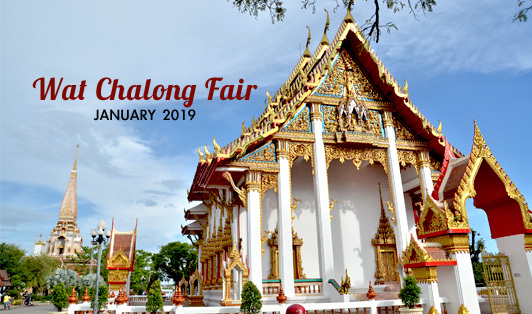 In latter years, they set up the fair over the Chinese New Year period to encourage a sense of togetherness and mutual enjoyment between the local Thais and the resident Chinese folk.